Urge Secretary of Agriculture Tom Vilsack to confiscate all ailing animals from Ringling now. Nicole, Sara, and Rudy are all hauled around by Ringling Bros. and Barnum & Bailey Circus, yet all three of these elephants are suffering from painful and chronic health problems. In the most recent inspection report issued by the U.S. Department of Agriculture (USDA), Ringling’s elephant caretaker claimed that he couldn’t provide these three elephants with daily veterinary treatment because he can’t access them when they are confined to boxcars. Nicole, Sara, and Rudy received no medication for their conditions for days on end. Sign an online petition here. Nicole has a long history of lameness and chronic foot problems—the leading reason why captive elephants are euthanized—including a longstanding nail bed abscess. Rudy also has a history of foot problems, including a current nail crack. And Sara was diagnosed with chronic lameness in 2009 when she was just 9 years old, yet Ringling has continued to force her to perform. 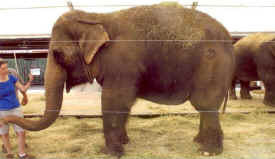 The inspection report notes that the elephants missed treatments for periods of two to four days, which indicates that they were likely confined to boxcars for such prolonged periods. Federal law prohibits confining animals for longer than 28 hours at a stretch, so PETA has filed a complaint with the USDA urging the agency to investigate the apparent violations of this law. Imagine if you had to walk to work every day while suffering from a debilitating medical condition that caused your joints to ache and your feet to throb. At work, you'd be kept on your feet constantly and forced to perform physical labor for long shifts. You'd be given no chance to recuperate (much less retire), and when you slowed down or balked, your boss would hit you with something resembling a fireplace poker or would stick the pointy end of the instrument under your chin and drag you around. When you weren't working, you would live in chains. That's pretty much what life is like for Karen and Nicole—two crippled elephants who are shunted from town to town by Ringling Bros. and Barnum & Bailey Circus. The U.S. Department of Agriculture (USDA) has the ability and the responsibility to seize suffering animals, yet the agency allows them to travel up to 50 weeks a year in cramped and filthy boxcars and trailers, to be kept tightly chained by two legs (and sometimes all four), and to be beaten for even looking sideways at a trainer. PETA's complaints against Ringling Bros.—persistently filed over several years—regarding beatings and the death of elephants, including one particular baby who succumbed during training, led to the largest fine in circus history. But while fining Ringling Bros. is a step in the right direction, it is only the first step and does nothing to stop the horrors that elephants are enduring at this very moment. In July 2012, after a thorough inspection by an elephant expert, Nicole and Karen were found to be arthritic, crippled, and in chronic pain. Even though the expert notified the city of Los Angeles of their dire condition and recommended that the elephants sit out of the show, Karen and Nicole were forced to perform as usual. This is just one of the numerous examples of city officials ignoring compelling evidence and the opinions of independent experts. Since local jurisdictions have not acted on the clear evidence of abuse and neglect, it is up to the USDA to see to it that the federal laws designed to protect these animals are enforced.